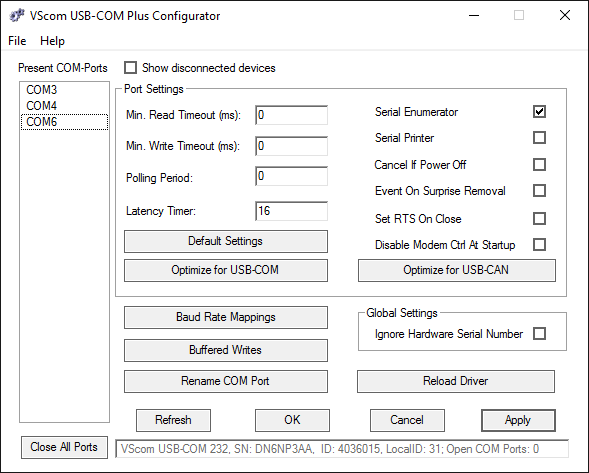 The USB-16COM Plus provides easy serial port expansion over USB 2.0 connecting to high speed RS232 or RS422/485 devices. The device is fully ESD and surge protected, bus powered and accommodated in a ruggedized metal housing. Furthermore, it can operate across a large range of temperature levels to cope with harsh operating conditions. The ISO version is 2.5kV electrically isolated to withstand unbalanced ground loops that arise in hazardous industrial environment. Lastly, both DIN-Rail and wall-mounting options are available. Models marked with "232" are fixed to the RS232 mode. Com Port drivers are available for Windows, Linux and Mac OS X. A configuration tool allows easy access to special Windows driver options. Standard drivers are available for all major operating systems. The USB 2.0 High-Speed enables serial data rates of up to 1000kbps in RS232. The device also allows every non-standard bitrate up to max. speed. A USB-out (type A) connector at the rear side allows easy expansion of serial ports by simple concatenation of further USB-COM Plus modules; we call it "USB-Through" feature. The really small and robust embedded system! Low Power Consumption, Professional construction inside!